Holiday shopping. Here's how it goes: 1 for you, 2 for me. I'm a sucker for funky looking things, even if its something I don't need right away or its not the right season. I'm buying it anyway because nothing gets stuck in your head worse than the things we put down at the store. Not even a Taylor Swift song. I'm holiday shopping and came across this bad boy literally blinding me. I picked it up, and put it down. Picked it up, then put it back down again. Walked away, then came back and said "I need to have you". I don't care how ugly my futuristic clutch is, if it stands out, it's for me. 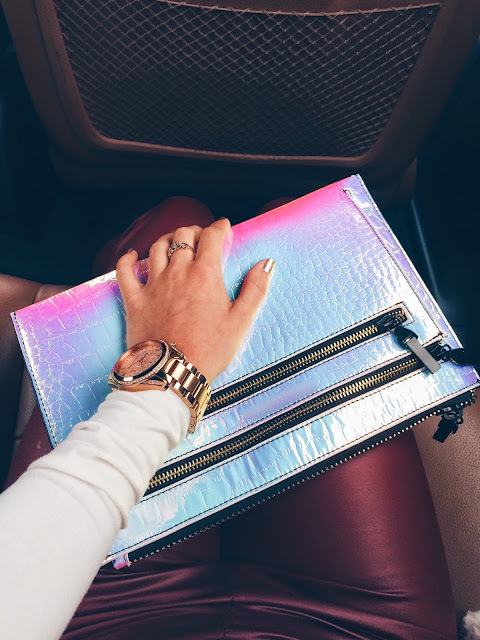 I'm obsessed with the iridescent-holograph trend, especially to dress up that all-black wardrobe we all possess. I've said it once and I'll say it again: UK does it best.